Home Contact us Join the club! 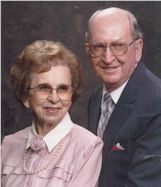 This page is dedicated to Claude and Martina Eckert who spent countless hours of their time and promoted our Partnership to where it is today. In 1846, residents of Pfaffenweiler, Germany, settled in Jasper, Indiana. 138 years later, Dubois County residents went back and asked the community that spawned them to be Jasper's Sister City. Jasper, 50 miles north of the Ohio River in southwestern Indiana, is a city of 12,000 people. The community was platted in 1830 when it became the Dubois County seat. Home to many woodworking industries, Jasper is called "The Nation's Wood Capital." Pfaffenweiler, in the foothills of the Black Forest, is a town of about 2,600 people. In the state of Baden- Wuerttemberg, just south of Freiburg, the community lies 40 miles north of Switzerland and about 16 miles east of where the Rhine River borders France. Pfaffenweiler dates back more than 1200 years and is known for its stone quarries and for growing grapes and making wine. In the 1840s, though, the grapes weren't so many and the wine wasn't so good. Father Joseph Kundek, who at that time was establishing St. Joseph 's parish in the newly platted Jasper, knew the people of the Pfaffenweiler area -- predominantly Catholic -- were having difficulties. He knew the economy of the town was very bad due to poor weather conditions ruining the grape harvest; poor-quality grapes meant a low-quality wine that would not sell. He also knew they were experiencing a rapid population increase and a potato famine at the same time, resulting in a food shortage. Furthermore, in the early 1800s, Baden had a system whereby a father divided his acreage equally among his sons, which resulted in ever-smaller parcels of land that could not grow enough crops to support a family. Worsening the situation was a custom of rotating the land, leaving a third of it fallow each year. Father Kundek invited residents of the poor German town to join his new parish. On March 24, 1847, a total of 85 Pfaffenweiler men, women and children joined thousands of Germans who left that country in the 1840s heading for America, "Das Land Der Unbegrenzten Moeglichkeiten " -- The Land of Unlimited Opportunities. Among those making the 52-day trip on the sailing ship "Tallahassee" were families named Eckerle, Eckert, Erb, Kiefer, Kraft, Lang, Schmidt, Schuble and Steinle. Others making the trip were named Baumann, Beck, Brucker, Blattmann, Daeschle, Georg, Stenftenagel and Zipfel. They sailed from Rotterdam through LeHavre, following the trade winds by sailing ship to New Orleans, then by boat up the Mississippi and Ohio rivers to Troy, Indiana, and on foot to Ferdinand and Jasper, where they arrived June 15, 1847. Records show that one of the best-known episodes of the trip was that a terrible storm arose at sea and nearly caused the demise of all on board. Being devout Catholics, they knelt in prayer. A stone mason named Johann Georg Baumann promised the Lord that if they were delivered from this storm he would erect a monument at their destination, Jasper. 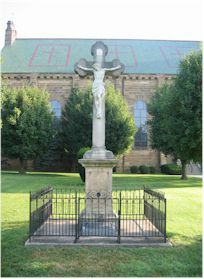 A replica of the stone cross that he sculpted -- the original was destroyed by lightning in the 1930s -- still stands on the south side of St. Joseph 's Church. Baumann later entered the Benedictine Seminary at Latrobe, Pennsylvania, and became a priest. Thereafter known as Father Theobold, he died on June 24, 1867. Sabine Jordan, Ph.D., who was commissioned by the Jasper Community Arts Commission from June 1980, to June 1981, to research the German heritage of Dubois County and Jasper, Indiana, in part unearthed this history. The project, called "The German American Experience in Dubois County," also received partial support from local funds. Jordan solicited the assistance of Ruth Reichmann, Ph.D., the Indiana representative and state coordinator for Sister Cities International in Indiana. President Dwight D. Eisenhower initiated the Sister Cities International program in 1956. Eisenhower believed it took people dealing with people to make peace and friendship, rather than governments dealing with governments. Every American president since then has served as honorary chairman and has endorsed and supported the program. As part of her work, Jordan wrote every community from where Jasper immigrants came; Pfaffenweiler Mayor Emil Eckert was the only person to respond, and Jordan thought the community would make an excellent Sister City for Jasper. At this same time, the Jasper Action Team -- headed by Dave Buehler -- was searching for a Sister City. When Jordan gave a lecture July 2, 1983, in Freiburg and talked about Jasper, the new mayor, Fritz Gutgsell, took a busload of Pfaffenweiler residents to hear her. That group, too, got excited about the proposed partnership. While in Germany in March of 1984, Ruth and Eberhard Reichmann met with Gutgsell and suggested that he invite the people of Jasper to visit his town. Upon an invitation from the Buergermeister two months later, a delegation of 39 Jasper and other Dubois County citizens making a trip to Europe visited Pfaffenweiler in September of that same year. After spending two nights and one day in Pfaffenweiler, it was the consensus of the tour group that, because of the genealogy and heritage between the two towns, Pfaffenweiler and Jasper should become Sister Cities.